Cheep-Cheep for Smash, or else I swear off Twinkies forever. Why would pinhead do anything against them? He would probably enjoy their... Uh... Services. 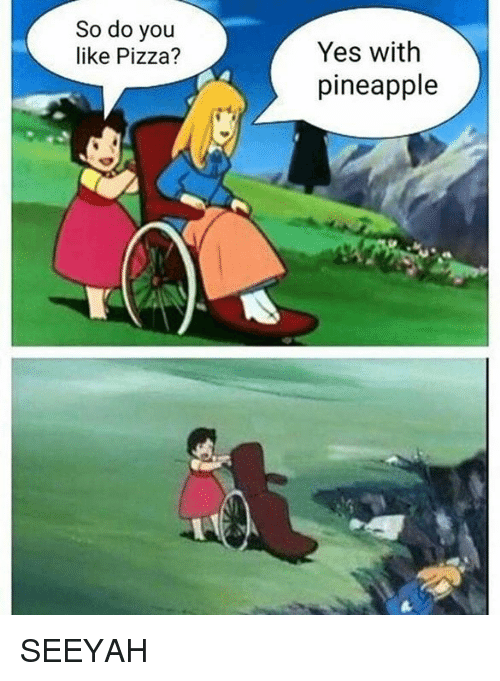 Fun fact: The president of Iceland said he would ban pineapple pizza if he could. He's just jaleous because pineapples don't grow on ice. My local Hawaiian restaurant sells pineapple pizza, and at a good price. Definitely tasted better than I imagined. why should Jason Fight Freddy ??? krueger beat jason by forcing him to eat a pineapple pizza. its like kryptonite to superman. they sell it for a good price to get rid of it because no one wants it! I had some pineapple pizza today, and it was actually pretty good. I'm sure you guys are all right now saying "Too bad that new downvoting thing doesn't work on forum posts"
Cool, I'm having a Neapolitan one tomorrow. That means that Camp Crystal Lake could have been amazing if they put pineapple pizza on the menu. Also, it means that pineapple pizza is better than Superman. Maybe the devs of Superman 64 were eating it, got some on the keyboard, and that’s why the game is awful. Also, is anyone going to be on during the direct/treehouse Thursday? I’m sure there will be a chat. Hopefully IT doesn’t jack my YouTube access again. EDIT: FFFFFF- Forgot to get a drink with it, and my fridge is empty...guess I'll stop by Stewarts and grab some soda, maybe grab some Halloween candy while I'm there. I'm almost sure they're just using pineapple pizza as an alternative name for the traditional Hawaiian pizza. Btw, i can make something interesting from Pizza with Pineapple. Apple goes well with cream cheese or goat cheese if you plan to make a pizza out of it. Yeah, apple's surprisingly great on Pizza. Actually, there are a number of sweet toppings that can taste good on a pizza. I've had breakfast and dessert pizzas plenty of times. I'll probably listen/pseudo watch the Direct. I have to work around then unfortunately. As for the Treehouse stuff, I'll wait until Ninty uploads those segments and then watch the ones I want. DOOD! Pineapple cream cheese is amazing! Candy day tomorrow. Gonna buy a bag of mixed candies, dress up as a kangaroo and lie in my depression. Anyone remember Rejected by Don Hertzfeldt from the early days of Youtube? Well, it seems like he just recently uploaded a restored Blu Ray version so we can now re-watch his wonderful animation in 1080p!